Whenever one of our ravishing cyrtochilums flowers I want to call the newspaper. They are just so exceptional in every way--exceptionally beautiful, exceptionally rare in cultivation, and unfortunately, exceptionally difficult to grow outside of the cloud forest. I feel flattered when one of ours flowers. All of the Cyrtochilum species are native to the misty upland forests of the Andes where their extraordinarily long rhizomes scramble up trees and shrubs. But it's the flower spike, or inflorescence, that will make you stop for a second look. It's a graceful twining strand that winds its way up, around and among surrounding trees like rainforest tinsel, with as many as 100 flowers per strand. Cyrtochilum serratum is native to Ecuador and Colombia. 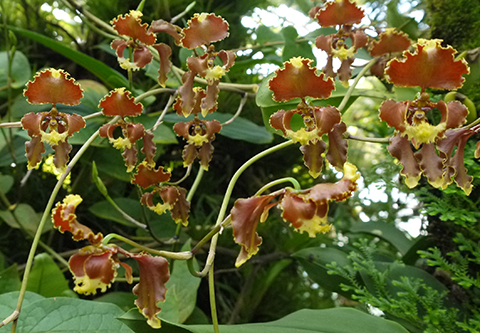 If you guessed that Cyrtochilum is closely related to Oncidium, the Dancing Lady Orchid, you are correct. Magnifica indeed. 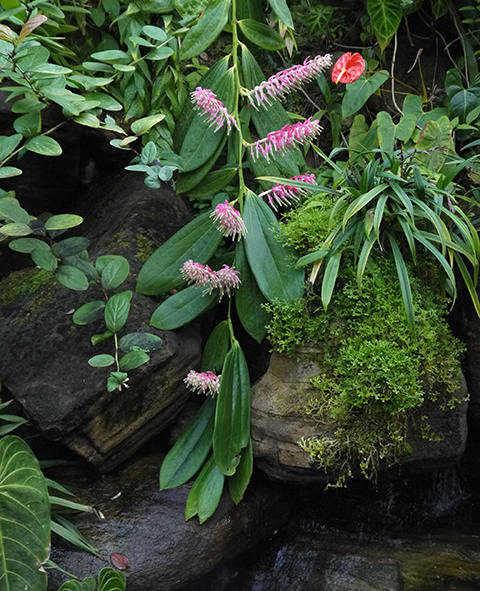 Without a doubt, the most commented upon plant in the Orchid Center right now is Medinilla magnifica, one of the all time great plants for conservatories. Not an orchid. It is a large shrub in the mostly tropical and frequently ornamental Melastomataceae. I have noticed M. magnifica for sale in Atlanta garden centers this month. It is not hardy in Atlanta. 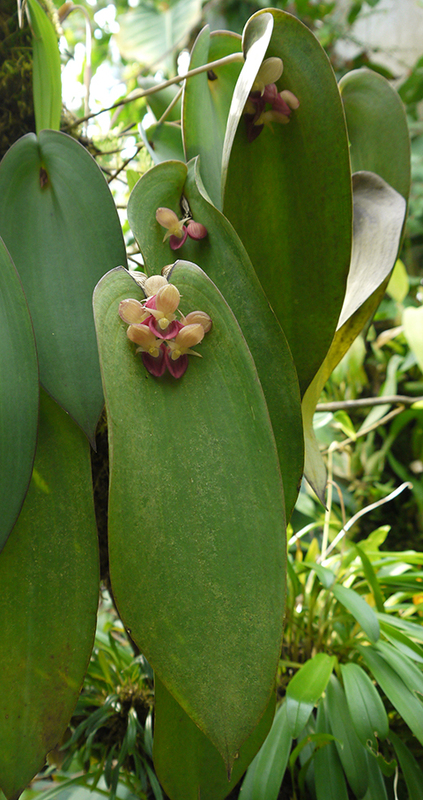 Melastomes, even large ones like Medinilla magnifica, are easily rooted by cuttings. 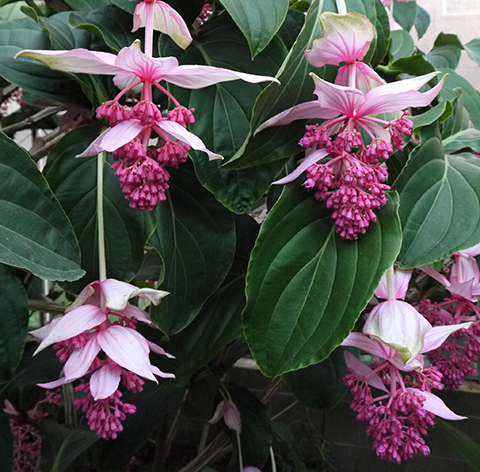 We have quite a nice collection of melastomes at ABG, and if you like M. magnifica you will love our recently installed Medinilla miniata, similar in size and aspect, but with fiery red flowers. Melastomes come in all sizes, but they are easy to recognize. The leaves are opposite with veins that lie parallel to one another. The flowers have a peculiar feature: the stamens are elbow-shaped. If you visit the Tropical High Elevation House this week you will see a burst of flowers on some of my favorite clamshell orchids, Pleurothallis cyanea, P. gigantea and P. teaguei, P. marthae and ever-blooming P. titan. I love the thick coriaceous leaves on Pleurothallis cyanea. Cavendishia grandifolia is one of the most impressive plants in the Tropical High Elevation House and certainly our largest shrub. It's astonishing to realize that this plant, with its fifteen foot pendant branches is an epiphyte. It's a mighty plant that can support one of these sprawling monsters. Each of the thick platter-like leaves is ten to twelve inches long. You can get a closer look at those gorgeous tubular flowers here. We have two grandifolias: the one pictured above cascades over the waterfall; the other is draped over the arch of the tepui. Lots of orchids in flower this week! Please stop by for a visit.